Some monthly comics sneak in quietly, do their thing and quietly disappear. Others start, sputter and choke in their infancy. And then some come along and make waves. ‘The Sandman’ started a tsunami. ‘The Sandman’ came about following the success of the Black Orchid miniseries and the continuing critical and commercial success of British authors, including Grant Morrison and Alan Moore, who between them had already produced ‘Watchmen’, ‘V for Vendetta’ and ‘Arkham Asylum’. Though the DC universe already had a character named The Sandman that Gaiman had expressed an interest in writing he was being used by another author, and so editor Karen Berger urged Gaiman to create a new, unique character that used the name and virtually nothing else, resulting in one of the most ambitious and important comic book series of the 1980’s/1990’s. The first volume of the series is probably, in terms of narrative, the most conventional, taking the form of a classic quest as the title character escapes imprisonment and immediately attempts to relocate his tools of office. The story opens in 1918 with a magus attempting to capture and imprison Death itself, thus proving his own pre-eminence in magical circles. This fails and instead he captures the weakened figure referred to at various times throughout the series as Morpheus, Oneiros, the Sandman and, most commonly, Dream. This act causes dozens of individuals around the world to succumb to a ‘Sleeping Sickness’ and inspires one individual to dub himself ‘The Sandman’ and fight crime in a gas mask (in fact DC’s original Sandman). Refusing to accede to his captors’ demands, or indeed to directly acknowledge them, Dream is kept imprisoned by the magus and then later by his son for seven decades until he gets a chance to escape. After taking his revenge on his captors he then goes about retrieving his pouch containing an inexhaustible supply of dream giving sand, his helm made from the bones of Gods who had once challenged him and a ruby made of his own essence. These quests see the Sandman travel through his own realm, the Dreaming, introducing us to his domain and to some of its inhabitants; quite the worse for wear since the Dream kings imprisonment. After summoning the three fates, also known as the Eumenidies, the Kindly Ones and the Furies, to find out the whereabouts of his tools. Their laughter as the Dream King thanks them reverberates through the rest of the series. The first of these, the pouch, was last in the possession of the magician John Constantine. Quickly establishing that it is now with a former lover, the two go in search of it, finding a small patch of hell on earth, where dreams, addiction and reality have collided at a shocking cost to a young woman and her family. Discovering that the pouch’s sand is all that keeping her alive, Dream very nearly leaves her to expire without a second thought until Constantine pleads for a boon. The boon is granted and the woman goes to her death in a soothing, comforting dream, but the encounter demonstrates just how little a single human being means to Dream. We then travel to Hell where the DC character Etrigan acts as a guide, leading the Dream king with obvious glee to the lords of Hell via a prison cell containing a woman named Nada, confined at Morpheus’ behest. 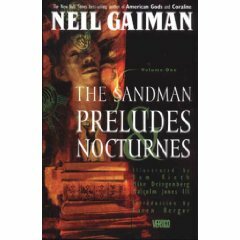 After a gathering of all the entities in Hell the Sandman identifies the new owner of his helm, the demon challenges the Sandman in a game of wordplay that is quintessential Gaiman. Victorious, Dream moves on to complete his quest but not before earning the enmity of Lucifer, who promises to destroy him, a threat that comes back to haunt the title character in the ‘Season of Mists’ storyline. Morpheus then comes to reclaim his ruby, now in the possession of Doctor Dee, a psychotic who uses the ruby to drive the world insane, graphically displayed in the issue ’24 hours’ as Dee turns a small town diner into a charnel house. Angered by Dee’s perversion of his power, the Sandman draws him into a chase through dreams, one which ends with Dee, having realised that the Ruby is a part of Morpheus, shattering the jewel in order to destroy his adversary. Instead it frees the power trapped in the Ruby, restoring the Sandman to an extent that surprises even him. In gratitude Morpheus does not punish Dee for his transgressions, instead giving him the ‘Wizard of Oz’ treatment, taking him home to Arkham Asylum. With his quest complete the Sandman then decides to mope around and feed the pigeons, prompting a visit from one the most popular characters to appear in the series, his older sister, Death. Starting the conversation with ‘Supercalifragilisticexpialadocius’ she then proceeds to berate her brother for his brooding and invites him to follow her as she gathers up the souls of the dead. Witnessing his sister perform her duties and take care of her responsibilities he is reminded of his own function and place, resolving to return to the Dreaming and begin the task of rebuilding his kingdom. ‘The Sandman’ is one of the titles brought up during the mainstream media during the periodic ‘are comics for adults?’ debates and it’s easy to see why. Literate, intelligent, witty, funny and moving, ‘The Sandman’ is a great story told with flair by a gifted writer who, over the course of the series, would reach his absolute peak. And while Preludes and Nocturnes represents, in my opinion, the weakest collection of stories, it still represents a great achievement, the last three issues particularly making an indelible impression. The remaining issues sometimes feel slightly clunky, occasionally betraying the fact that the series was still finding its feet, its own voice, but each has a wealth of ideas and moments that mark out Gaiman’s work. And so to the art. Gaiman’s decision to bring in a number of different artists to illustrate different arcs or even one off tales means that unlike many later Vertigo titles the series never had a particular ‘look’ (though the fact that Dave McKean created each and every cover for the series certainly made it stand out). For me the highly stylised artwork of Sam Keith remains some of the weakest in the series, though a recent recolouring in the Absolute Editions have improved it somewhat. It is a case of an artist not being well suited to the material (Sam Keith described himself as Jimi Hendrix trying to play in the Beatles) and my personal enjoyment of the book increased when Mike Dringenberg took over pencilling work. Indeed his rendition of Dream remains for me the definitive version, and the fact remains that in this volume and the second, it was Dringenberg who established the look of most of the Endless and many of the recurring characters in The Dreaming, making him one of the most important influences on the book. What may also seem odd to readers today is that the series, a work of horror/fantasy, takes place in the mainstream DC universe, as evidenced by the cameos throughout Preludes and Nocturnes. In the modern comic marketplace this would seem odd, but at the time of the books launch there was no Vertigo imprint for creator owned series, indeed it was the success of Sandman critically and commercially and helped convince the heads of DC to create the Vertigo imprint which has served as home to some the best comics of the past decade and a half. Some have felt that the inclusion of DC characters detracts from the first story arc, providing an unnecessary and unwelcome jolt out of the story being told. Similar criticisms were also levelled at Alan Moore’s run on ‘Swamp Thing’, tonally the book ‘The Sandman’ is closest to, but while it may not be to everyone’s liking, it is simply the editorial standard of the time, and it certainly never feels like it impinged on the larger story being constructed by Gaiman. So here it is in all its awkwardness, brilliance and occasional beauty. The first steps on a much longer path that that took Gaiman seven years and two thousand pages to complete. Along the way he and it picked up just about every award given to comic books and one or two that weren’t, a sizable collection of fans and the plaudits of a great many critics and authors who had previously looked on comic books as a stunted, weird little relative of real literature. If there is one criticism that can be levelled at this collection, the one criticism that simply cannot be discounted, it is simply that it doesn’t quite live up to what came next.